(Nanowerk News) Researchers at MIT have followed up on their discovery that droplets of water acquire an electric charge when jumping from certain condenser surfaces by finding a way to make use of that effect: They found that by applying an electric field to the system, the droplets “jump” more rapidly away from the surface. In this way, the efficiency of heat transfer from that surface can be nearly doubled. The work is reported in the journal ACS Nano ("Electric-Field-Enhanced Condensation on Superhydrophobic Nanostructured Surfaces") by MIT postdoc Nenad Miljkovic, associate professor of mechanical engineering Evelyn Wang, graduate student Daniel Preston, and former postdoc Ryan Enright. The finding could have a number of applications, Miljkovic suggests, including in prevention of ice buildup on refrigerator condensing coils and improved cooling of high-performance computer chips. 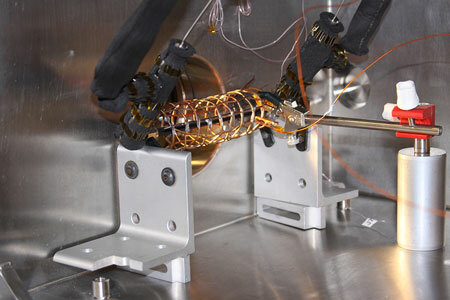 An open structure of copper wire surrounding a pipe was used in the lab to measure how effective an electric field can be in pulling droplets away from a condenser surface. In combination with a particular kind of superhydrophobic surface, the new system can nearly double the efficiency of the cooling process, the researchers found. Miljkovic and his co-workers had originally found, earlier this year, that a particular kind of nanopatterning of condenser surfaces — producing a superhydrophobic surface — could cause pairs of droplets to jump from those surfaces because of energy released when they coalesce. That phenomenon alone could produce a 30 percent improvement in the efficiency of heat transfer from condenser surfaces, they found. Then, in a serendipitous discovery, they noticed that these droplets spontaneously acquired a positive electric charge as they jumped away. Harnessing that discovery, the researchers have now found that grounding the condenser surface and applying a negative voltage to a wire mesh tube surrounding it attracts jumping droplets away from the surface and toward the mesh — preventing a push back to the surface by the pressure of surrounding water vapor. That phenomenon is “one of the bottlenecks” to improving the efficiency of heat transfer, Miljkovic says. Because of that vapor entrainment, he says, “not all of the droplets jump away and escape the surface: Some go back, and that can reduce the performance.” The droplets’ return can cause water to build up on the surface, and reduce heat transfer and lead to ice buildup in freezing conditions. But the applied electric field can sharply reduce these problems, Miljkovic says. This effect could lead to a decrease in the energy and maintenance needed to run commercial refrigeration units, such as those used by supermarkets, he says, by preventing ice buildup on the condenser coils. Some companies that manufacture such equipment have already shown interest in the technology, Miljkovic says. The system could also improve the efficiency of advanced condensation-based cooling systems, such as the vapor chambers and heat pipes used in some advanced microprocessor chips, where a buildup of water on the condensing surface interferes with heat transfer. Miljkovic suggests that simply applying a positive charge to the nanostructure beneath the hydrophobic coating on the superhydrophobic surface, removing the negatively charged mesh, and electrically grounding the condenser casing could provide the same effect by repelling droplets. This could provide a simpler system, and one that would be easier to add to existing condenser designs. While the laboratory tests used for this research involved scalable, nanostructured copper tubing and mesh, Miljkovic stresses that the effects are independent of the materials used: For example, less-expensive aluminum tubing with proper nanostructuring will work as well. In addition to enhancing heat transfer, the process could also be used to enhance the performance of self-cleaning surfaces based on jumping droplets, Miljkovic says: As droplets bounce away from a surface, any dust or dirt particles on that surface tend to be carried away with them. The more thoroughly the droplets are removed, the cleaner the surface.